Census Bureau: 4 Richest Counties in U.S. Are Suburbs of D.C.
(CNSNews.com) - The four richest counties in the United States, when measured by median household income, are all suburbs of Washington, D.C., according to newly released data from the Census Bureau. They are Loudoun County, Va., where the median household income was $125,900 in 2015; Falls Church City, Va., where it was $122,092; Fairfax County, Va., where it was $112,844; and Howard County, Md., where it was $110,224. The Census Bureau treats independent cities such as Falls Church, Va., as the equivalent of a county when calculating its median household income statistics. Nationwide, the median household income in 2015 was $55,755, according to the Census Bureau. That means the local median household income in each of the nation’s three richest counties—all of which are Washington suburbs in Northern Virginia—are more than twice the national median household income. Of the Top 20 richest counties in the nation, nine are suburbs of the city that serves as the seat of a federal government that in fiscal 2016 taxed away $3,266,774,000,000 from the American people, spent $3,854,100,000,000, and ran a $587,326,000,000 deficit. Six of the Top 20 richest counties are in Northern Virginia. That gives Virginia twice as many counties in the Top 20 as any other state. Maryland, New Jersey and California all put three counties on the Top 20 list. New York, New Mexico, Colorado, Tennessee and Georgia each had one. Maryland’s three counties in the Top 20—Howard, Calvert and Montgomery—are all suburbs of Washington, D.C.
New Jersey’s three—Hunterdon, Morris and Somerset County—are in the suburbs and outer suburbs of New York City. California’s three include two in Silicon Valley—Santa Clara and San Mateo—and Marin County, which sits just north of San Francisco on the other side of the Golden Gate Bridge. New York’s one county on the list—Nassau—sits on Long Island and borders New York City. New Mexico’s one county on the list—Los Alamos, which ranks No. 6—is the location of the federal government’s Las Alamos National Laboratory. “The 2015 SAIPE provides estimates for 3,141 counties in the United States,” says the Census Bureau. 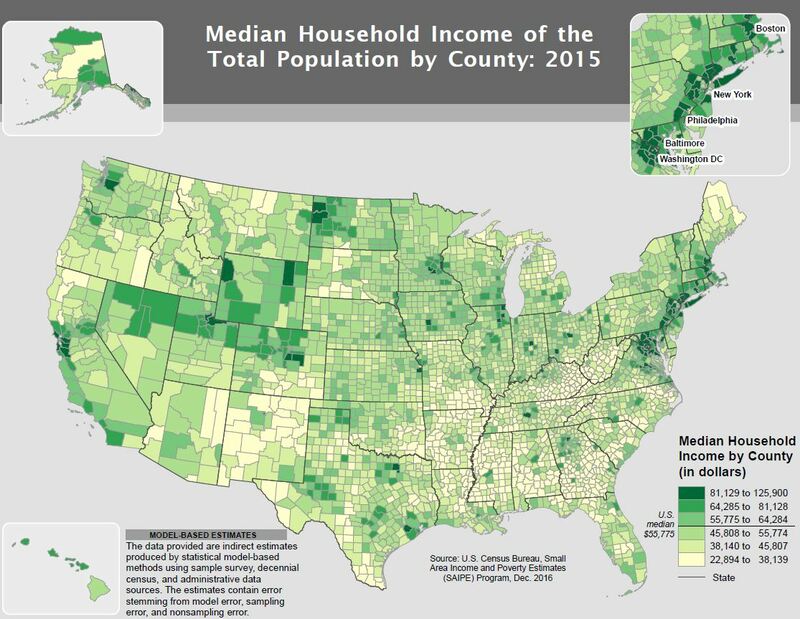 A Census Bureau report on the "highlights" of the data released yesterday noted that the nation’s wealthiest counties are disproportionately in the corridor of territory that runs from Virginia and Maryland and then north along the East Coast. 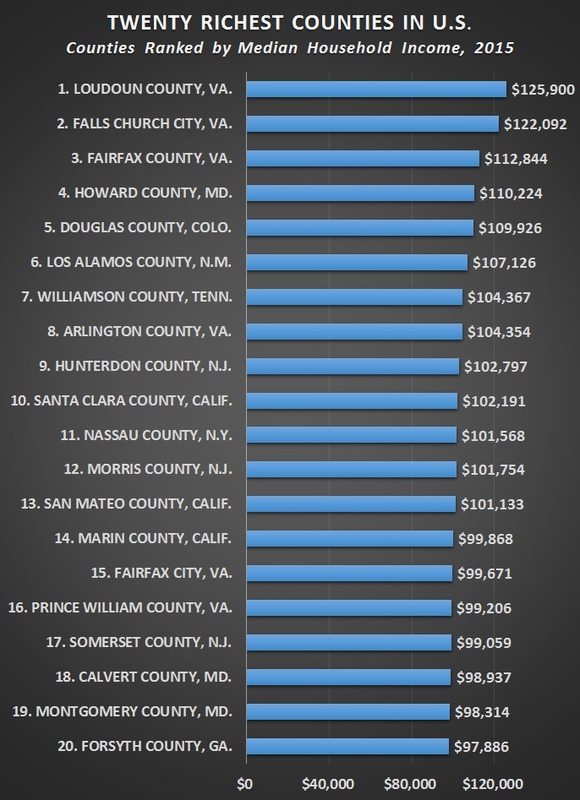 In 2014 as well as in 2015, Loudon County, Falls Church City, and Fairfax County were the three richest counties in the country, according to the Census Bureau’s estimates. But between 2014 to 2015, Falls Church City and Loudoun County changed places. In 2014, Falls Church City was No. 1 with a median household income of $125,835 and Loudoun County was No. 2 with a median household income of $122,641. In 2014, Fairfax County was No. 3 with a median household income of $110,507 and Los Alamos County, N.M., was No. 4 with a median household income of $108,477. From 2014 to 2015, Howard County moved up from No. 7 with a median household income of $106,871 to No. 4 with a median household income of $110,224.